The oldest church in Stockholm, Storkyrkan dates from the earliest days of the city. Its existence is documented as early as the 1270s. Successive expansions over the following centuries gave the church its present late gothic character. It is dedicated to St. Nicolaus. The interior of the cathedral is primarily baroque. The most magnificent work of art is Bernt Notke’s monumental carved-oak sculpture of St. George and the Dragon. It was commissioned by Sten Sture the Elder, a prominent 15th-century statesman and twice regent of Sweden, to commemorate his victory over the Danes at the Battle of Brunkeberg. Don’t miss the oil painting Vädersolstavlan, on the south wall. A 1636 copy of an original from 1535, it is the oldest surviving image of Stockholm. 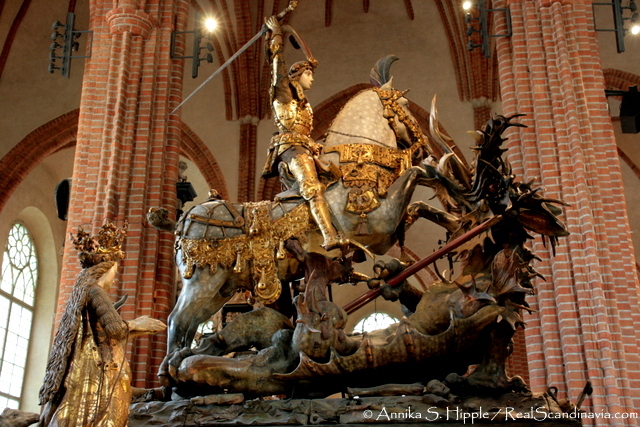 A bronze copy of St. George and the Dragon stands at Köpmanbrinken off Österlånggatan. It was unveiled on the 441st anniversary of the Battle of Brunkeberg. Open daily 9 a.m. to 4 p.m.; extended hours on weekdays until 5 p.m. in June-July and 6 p.m. in August. Admission: 40 SEK adults, 30 SEK seniors. Children under 18 free. 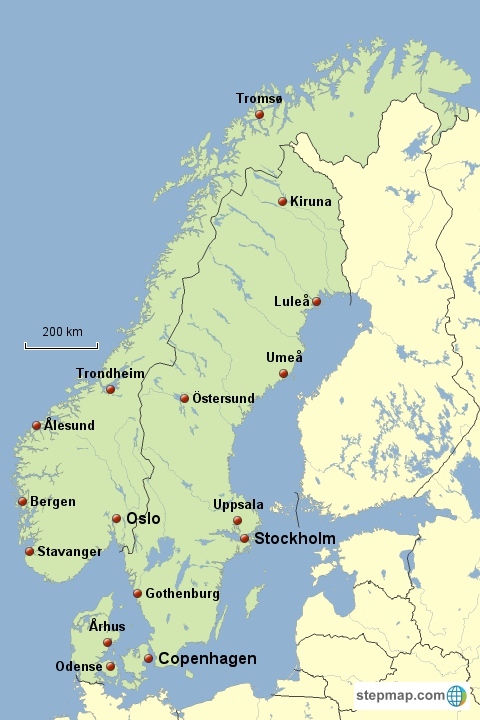 During the days of the Hanseatic League, Stockholm had close ties to Germany. 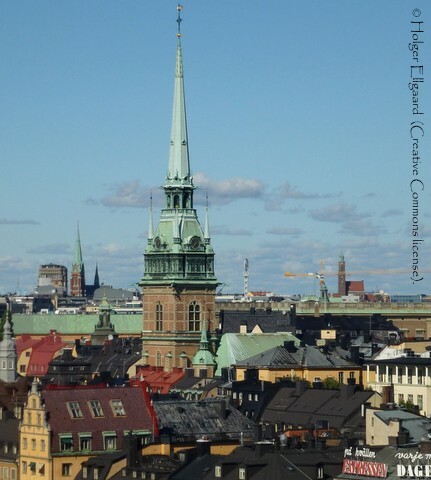 This history is reflected in Tyska kyrkan, the German Church of St. Gertrude. The core of the building dates back to the late 1500s. Additions were completed the following century to give the church its current size. The graceful spire was erected 140 years ago after a fire destroyed the original tower. The beautiful interior is the best example in Stockholm of a 17th century church. Tyska kyrkans pride and joy is the 350-year-old pulpit with carved alabaster figures of the apostles. Another treasure is the elaborately ornamented royal gallery. Photography buffs will get the best shot of the church from Tyska Brinken. The royal gallery was designed by Nicodemus Tessin the Elder, a member of the parish of St. Gertrude. The gallery was intended to be used by the German membes of the royal family. Svartmangatan 16, Gamla Stan. Tel: +46 (0)8 411 11 88. Open daily 10:30 a.m. to 4:30 p.m., mid-June to mid-August; daily 11 a.m. to 3 p.m., mid-May to mid-June and mid-August to mid-September. The rest of the year the church is open Wednesdays, Fridays, and Saturdays 11 a.m. to 3 p.m., and Sundays 12:30 p.m. to 3 p.m. Visiting Riddarholmskyrkan is like making a journey through Swedish royal history. 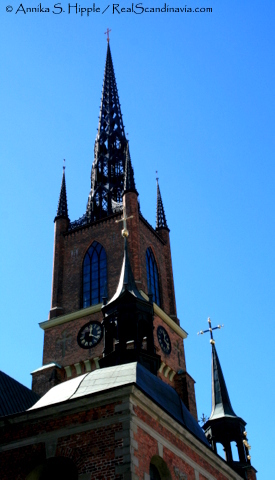 This church, located on the small island of Riddarholmen adjacent to Gamla Stan, is the burial place of more than 300 years of Swedish rulers and their consorts, from Gustav II Adolf, who died in 1632 during the Thirty Year’s War, to Gustaf V, the great-grandfather of the present king (died 1950). Several medieval kings are also buried here, including Magnus Ladulås, the founded of the church, who died in 1290, and Karl Knutsson Bonde (died 1470). The only Swedish ruler from 1632 to 1950 who is not buried in Riddarholmskyrkan is Gustav II Adolf’s daughter, Queen Kristina, who abdicated the throne after converting to Catholicism. She died in 1689 and is buried in St. Peter’s Basilica in Rome. The walls of the church are decorated with the painted coats of arms of deceased members of the Order of Seraphim, which dates back to the middle of the 18th century. These days it is only awarded to members of the royal family or foreign heads of state. 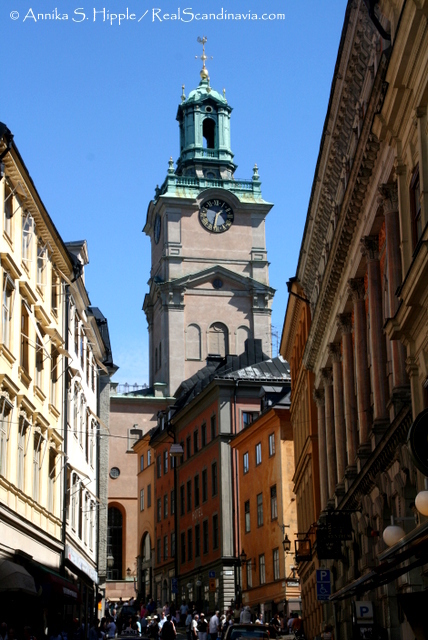 One of the oldest churches in Stockholm, Riddarholmskyrkan was begun in 1270 and completed around 1300. A third nave was added to the original two in the 1400s. The church has been used exclusively as a burial and memorial church since 1807; no regular masses are said here. The spire of Riddarholmskyrkan was destroyed by lightning in 1835. The current cast-iron spires were added during the reconstruction after the fire, and were recast during restoration in the late 1960s. To really make the history come alive, time your visit to coincide with one of the excellent guided tours sharing stories and little-known facts about the church and the many royals buried here. Birger Jarls torg, Riddarholmen. Tel: +46 (0)8 402 60 00. Open daily 10 a.m. – 5 p.m., mid-May-mid-September. Open weekends 10 a.m.-4 p.m., mid-May to late November. Closed the rest of the year. Admission: 50 SEK adults, 25 SEK children 7-18 and students. Children under 7 free in the company of a guardian. Guided tours (free with admission) are offered in Swedish and English daily; check the Riddarholmskyrkan website for current times. German church in gamla stan was wonderful and the main square of gamla stan so vibrant with musicians and artistic folk, filling for the soul, culturally diverse and rich. Good luck! I hope you enjoy Stockholm.